Raleigh Society's first overseas expedition was organised by then President Dr Tan Chi Chiu. Volunteers spent three weeks on Pulau Geranting on projects including digging of a new village well, refurbishment of a madrassah, and teaching English to local children. Led by Ong Ling Lee, a team of ‘crazy’ and motivated Raleigh Society volunteers organised a 36-hour, 130 round-island walk to raise $36,000 for the Spastic Children’s Association. The follow up to ORB I was led by Dr Eric Tan who brought volunteers to Pulau Bertam this time to undertake projects such as the rebuilding of a community hall. Led by Dr Chan Yew Wing, Raleigh Society volunteers went to Myanmar where they built a community hall in North Okkalapa in capital city Yangon. Led by Lee Yoke Wai, the volunteers built a new school in the village of Qi Ge Tu and renovated an existing school which is 31 years old.Homestay programme for a day with the locals were arranged where volunteers got to herd the sheep or do farm work. As part of the fourth challenge (giving back to community), some Operation Mingalaba volunteers, led by Paul Ng from Phase II, began a five-year outreach programme with patients from the IMH. The institute gave Raleigh Society a Group Long Service award in recognition of this sustained effort. Expedition leader Wong Yuen Lik brought volunteers to Songduo, a remote village in Tibet to help to build a school for nomadic children. Although the expedition was in June, temperatures often plunged below zero, giving Singapore volunteers a first-hand experience of working in extreme conditions such as snow and high-altitude. This mentoring programme gave a group of young rock climbers from ITE an opportunity to guide a group of younger boys from Boys Town to learn how to climb. Led by Chua Chee Beng, the team of Raleigh Society volunteers facilitated the unique programme that included a round-the-clock climbing event Beyond Everest, and a final climbing expedition to Krabi, Thailand. This round-island charity cycling event, led by Boey Lai Wan, was held on September 22, 2002. The beneficiaries of this event were Handicaps Welfare Association (HWA) and Ling Kwang Youth Centre (LKYC). After a seven-year break, the second instalment was organised by Dennis Chai. 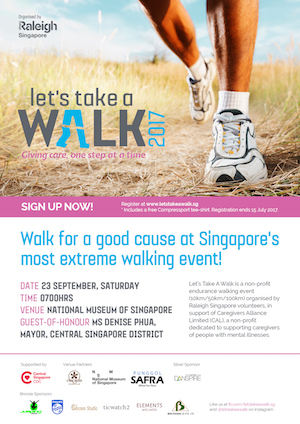 This time, the team raised S$37,208.61 for the Dover Park Hospice and Singapore After-Care Association (SANA). Raleigh Society is conferred the award by the Singapore Sports Council for using sports as a youth development tool. A mentoring programme, led by Bernice Lee, Lee Eer Ling and Tay Chiew Boon, that brought 30 teenaged youths from Jamiyah Children’s Home and 15 young working adults together through a six-month adventure-learning programme that included rock climbing, dragon boating, and an outdoor camp. Held April at YMCA, Raleigh Society invited our counterparts in Malaysia and Hong Kong to come to Singapore for a forum session to share and to exchange ideas and developments. This was Raleigh Society’s first foray into disaster response after the Dec 2004 tsunami and March 2005 earthquake in Sumatra, Indonesia. Over the three years, volunteers were involved in a variety of projects from play therapy for the traumatised children to organising health and hygiene awareness in schools. Lai Sheau Wen, Lee Eer Ling and Tay Chiew Boon led a group of students from Nanyang Girls High School to Krabi to renovate a nature trail in the national park. The team raised approximately S$13,000 for Sunshine Welfare Action Mission Home. The second instalment of the mentoring programme was led by Bernice Lee, Lee Eer Ling and Daniel Tan. Based on the same concept of a six-month adventure learning programme, a new batch of Jamiyah youth were selected and mentored by a group of working adults, who were guided and assisted by the first batch of mentors from Rakan Raleigh 2005. Led by Chan Peng, the 14-member team raised $55,000 for MINDS and Raleigh Society’s Operation Vannakam 2009. The event attracted the largest number of walkers since the 1997 event, with nearly 1000 walkers, volunteers and beneficiaries taking part. The expedition to India, led by Daniel Tan, was organised in partnership with the Centre for Tribal and Rural Development Trust (CTRD). The venturers helped to build a hospital for villagers in the Nilgiri Mountains in Tamil Nadu, India. Led by Ng Yousi, the team raised approximately S$40,000 for Boys' Town and Raleigh Society. This second instalment was a follow up of the work done by the first expedition to Nilgiri Mountains. Led by Tee Bee Tin, the venturers continued to work on the same hospital construction project which would fulfill the need of accessible medical care for the villagers. Representatives from Raleigh Support Groups around the region (Australia, Hong Kong, China, Sabah, KL, Bermuda, UK and Singapore) came together to share about the youth scene in their respective countries. Based on the similar concept of an adventure learning programme, Hon Maode led a team of working adults to mentor a group of boys from Boys' Town. Led by Ng Yousi, the committee raised approximately S$52,000 for Boy's Town and Raleigh Society. RARC representatives from the various Raleigh Support Groups joined us for a 5km walk to support the cause.